How Much Does Blown-In Insulation Cost? 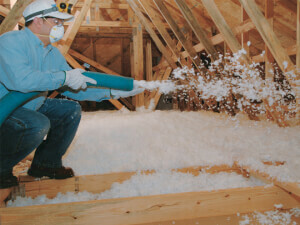 People frequently use blown-in insulation to thoroughly insulate walls and attics. Homeowners may also choose to put it in their floors. This material will slice your heating and cooling bills while reducing exposure to outdoor noise. It also costs less to install than other kinds of insulation. While this product is comparatively easy to use in attics, considerable skill is needed to insulate floors or walls. Contractors accomplish this by cutting holes in these surfaces and blowing suitable amounts of the insulating material inside walls and floors. 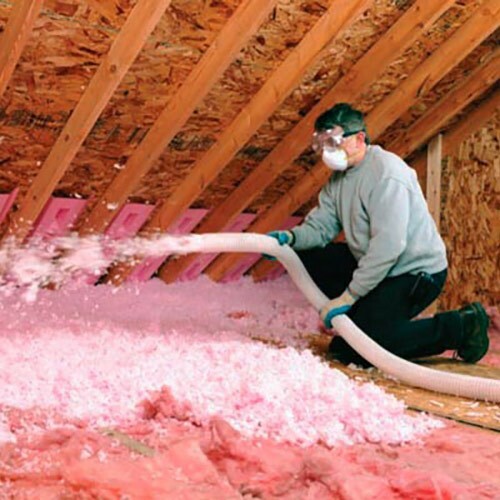 How Much Does It Cost to Install Blown-in Insulation? The cost to install blown-in insulation professionally is often almost equally divided between labor and materials. Workers earn an average of ￡46 per hour to install blown-in insulation. If you need to insulate 1,000 square feet, you can plan on paying about ￡127 for labor. Materials for this project will cost around ￡115. Contractors typically add another ￡50 to fund the maintenance and replacement of necessary tools, such as the blower equipment and specialized hoses. From preparing the area to installing blown-in insulation, a knowledgeable contractor will be able to give you the best bang for your buck. We recommend comparing several quotes in order to be sure you get the best deal available on today\\\\\\\\\\\\\\\\\\\\\\\\\\\\\\\'s market. What Factors Affect the Total Cost? The specific type of insulation is usually the most consequential aspect. Its thickness, brand, and material will have a major impact on the price you pay. 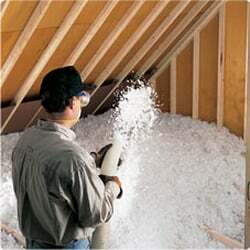 Furthermore, the places you want to insulate can significantly raise or lower labor costs. Floors and walls generally demand more effort than attics. The number of separate areas is important as well. Workers will take longer to make and patch multiple holes. Insulating material Interior square footage Installation methods Where it\\\\\\\\\\\\\\\\\\\\\\\\\\\\\\\'s needed 3 Common Blown-in Insulation Materials Compared Contractors may use cellulose, fiberglass or rock wool insulation for this project. An inch of cellulose provides more insulating power than the same amount of fiberglass. However, fiberglass costs considerably less. It\\\\\\\\\\\\\\\\\\\\\\\\\\\\\\\'s also much more resistant to moisture than the alternatives. Both cellulose and rock wool come from recycled materials. Rock wool does the most to block outdoor noise, but it\\\\\\\\\\\\\\\\\\\\\\\\\\\\\\\'s usually the costliest option. Average Cost Breakdown of Blown-in Insulation Across the nation, individuals reported spending an average of ￡385 on this service. The cost to install blown-in insulation frequently falls as low as ￡308 or, rises to amounts as high as ￡462. However, it\\\\\\\\\\\\\\\\\\\\\\\\\\\\\\\'s important to realize that this product can pay for itself more easily than most other home improvements. It not only reduces energy bills but, raises a home\\\\\\\\\\\\\\\\\\\\\\\\\\\\\\\'s resale value and makes it more attractive to renters. Your location has a considerable impact on the price of insulating a house. Materials, wages and transport expenditures will vary depending on the town you live in. Additionally, climatic differences ensure that homeowners need different amounts of insulation in each geographic region. How To Get a Free Quote To get accurate estimates on the cost to install blown-in insulation. You can request one for FREE here in the space provided; simply enter your zip code. The best part is you are under no obligation to purchase.